On October 21, 2016, vineyards, bars, hotels and wine lovers the world over will celebrate the fourth annual Champagne day. While there are now many alternative ways to enjoy Champagne, if you're going to indulge in this most exclusive of drinks it pays to do so properly. With this in mind we caught up with Francoise Peretti, director of Champagne Bureau UK, to find out everything you need to know when serving Champagne on board. Always ensure your store Champagne correctly "The ideal way to store Champagne is in a temperature-constant room/space," says Peretti. "Champagne is a delicate wine which must be kept away from temperature variations and light. In the region, Champagne is kept in cellars - we currently have 1.2 billion bottles ageing in the champagne cellars." Of course, while it isn't possible to have a traditional wine cellar on your yacht, the best superyacht wine cabinets provide an excellent alternative. On October 21, 2016, vineyards, bars, hotels and wine lovers the world over will celebrate the fourth annual Champagne day. While there are now many alternative ways to enjoy Champagne, if you're going to indulge in this most exclusive of drinks it pays to do so properly. With this in mind we caught up with Francoise Peretti, director of Champagne Bureau UK, to find out everything you need to know when serving Champagne on board. "The ideal way to store Champagne is in a temperature-constant room/space," says Peretti. "Champagne is a delicate wine which must be kept away from temperature variations and light. In the region, Champagne is kept in cellars - we currently have 1.2 billion bottles ageing in the champagne cellars." 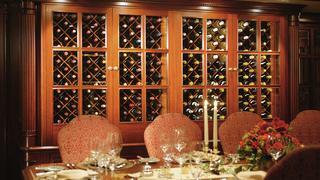 Of course, while it isn't possible to have a traditional wine cellar on your yacht, the best superyacht wine cabinets provide an excellent alternative. All wine connoisseurs know that using the right glasses can make a big difference to the flavour of Champagne so it's important to choose the best glasses for your superyacht. "The traditional flute still has a place to play even though the old favourite is quickly being edged out by tulip-shaped glassware such as the Riedel Veritas Champagne glass," comments Peretti. "The tulip-shape helps Champagne aromas develop and enhances the drinking experience. Saucer-shaped ‘coupes’, popular in the 1920s for their stable base when carried on trays, rapidly dissipate Champagne bubbles and are better left to the flapper girls ‘era or to serving puddings!" "The ideal temperature to serve Champagne is between eight and nine degrees Celsius," advises Peretti. "To chill your bottles to perfection, place them in the lower part of your fridge for 3-4 hours or in a mix of water and ice cubes 30-50 minutes prior to opening them. Do not forget to add water as ice only will take much longer to bring bottles to perfect chilling temperature. 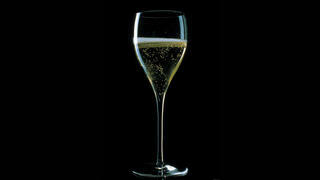 "Contrary to common wisdom the best way to pour Champagne is not by tilting the glass and definitely not to the rim! Pour a third in each glass to let the effervescence settle, then pour another third. Always leave a two finger space at the top." "The ideal temperature to serve Champagne is between eight and nine degrees Celsius," advises Peretti. "To chill your bottles to perfection, place them in the lower part of your fridge for 3-4 hours or in a mix of water and ice cubes 30-50 minutes prior to opening them. Do not forget to add water as ice only will take much longer to bring bottles to perfect chilling temperature. "Contrary to common wisdom the best way to pour Champagne is not by tilting the glass and definitely not to the rim! Pour a third in each glass to let the effervescence settle, then pour another third. Always leave a two finger space at the top." Champagne can be an excellent alternative to white or rosé wine with meals and is light enough to be enjoyed for celebrations at any time of day - just be sure to complement your bottle with the right dishes. 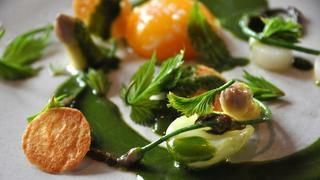 "Champagne pairs well with traditional as well as more unusual food and dishes," says Peretti. "A Chardonnay-based Champagne is ideal for breakfast as it pairs well with fluffy omelettes, creamy scrambled eggs, Eggs Benedict or Florentine and smoked salmon. "Choose a vintage Champagne (a blend of wines from the same harvest) to pair with white meat such as chicken, capon or turkey. Pink Champagne will match perfectly with smoked salmon but also has its place with cheese - especially goat and sheep cheeses. With Comte-style cheese, pick a blanc de noirs made with pinot noir or meunier. If you are with a group of fish-loving friends pour a refreshing glass of rosé Champagne to serve with grilled salmon steaks and king prawns. Finally choose a sweeter Champagne to sip with puddings." Champagne can be an excellent alternative to white or rosé wine with meals and is light enough to be enjoyed for celebrations at any time of day - just be sure to complement your bottle with the right dishes. 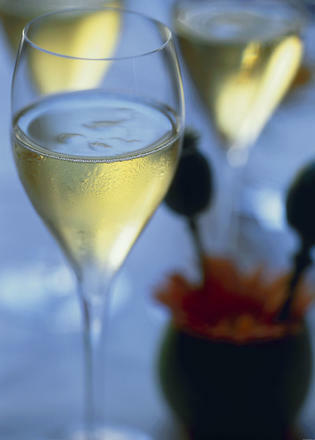 "Champagne pairs well with traditional as well as more unusual food and dishes," says Peretti. "A Chardonnay-based Champagne is ideal for breakfast as it pairs well with fluffy omelettes, creamy scrambled eggs, Eggs Benedict or Florentine and smoked salmon. "Choose a vintage Champagne (a blend of wines from the same harvest) to pair with white meat such as chicken, capon or turkey. Pink Champagne will match perfectly with smoked salmon but also has its place with cheese - especially goat and sheep cheeses. With Comte-style cheese, pick a blanc de noirs made with pinot noir or meunier. If you are with a group of fish-loving friends pour a refreshing glass of rosé Champagne to serve with grilled salmon steaks and king prawns. Finally choose a sweeter Champagne to sip with puddings."